You are currently browsing the tag archive for the ‘Art Collections and Botanical Gardens’ tag. 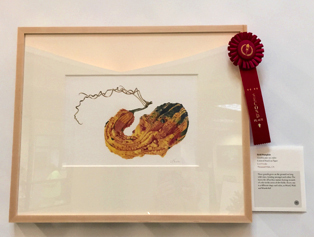 Close on the heels of the “Weird, Wild & Wonderful” Symposium at The Huntington Library, Art Collections and Botanical Gardens, the Botanical Artists Guild of Southern California (BAGSC), opened their supplemental exhibition of botanical oddities, in the Brody Botanical Center’s Banta Hall at The Huntington. The reception for the BAGSC adjunct exhibition was packed with family, friends, colleagues and the public. Weird, Wild & Wonderful Second New York Botanical Garden Triennial Exhibition was also open for viewing and enthusiastically received. Photo © Gayle Uyehara, 2015. The BAGSC adjunct exhibition features 72 artworks by 37 members, including: Bonnie Born Ash, Cristina Baltayian, Nancy Beckham, Melanie Campbell-Carter, Jan Clouse, Diane Daly, Estelle DeRidder, Nancy Grubb, Asuka Hishiki, Cynthia Jackson, Susan Jackson, Clara Josephs, Joan Keesey, Suzanne Kuuskmae, Teri Kuwahara, Patricia Mark, Lee McCaffree, Arillyn Moran-Lawrence, Kathy Morgan, Terri Munroe, Alyse Ochniak, Marilyn Parrino, Dolores Pope, Kathlyn Powell, Lesley Randall, Veronica Raymond, Robyn Reilman, Norma Sarkin, Mitsuko Schultz, Gilly Shaeffer, Janice Sharp, Deborah Shaw, Beth Stone, Gayle Uyehara, Lori Vreeke, Leslie Walker, Jude Wiesenfeld. 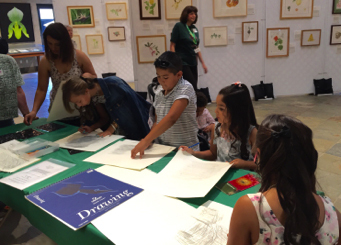 An exhibition of Botanical Oddities, illustrations by the Botanical Artists Guild of Southern California will continue each day through Sunday, August 9, 2015, 10:30 am – 4:30 pm in The Frances Lasker Brody Botanical Center at The Huntington. 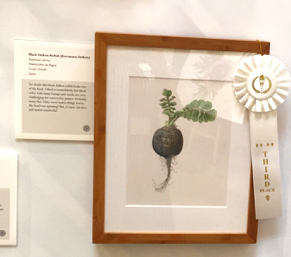 The Weird, Wild & Wonderful: The New York Botanical Garden Second Triennial Exhibition exhibition also will be open each day, Friday – Sunday, August 7 – 9, plus will continue to be open on weekends only until August 23. Join us before the BAGSC paintings are whisked away! Exploring stencil leaf rubbings in graphite and colored pencil at The Huntington. 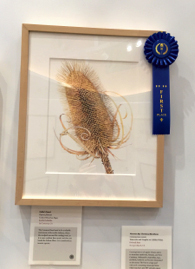 BAGSC artists are demonstrating for the public August 1 – 9 in conjunction with our group show of botanical oddities by the Botanical Artists Guild of Southern California. “Weird, Wild & Wonderful,” The New York Botanical Garden Second Triennial Exhibition, will be open each day through August 9, and then weekends only through August 23. Photo © Janice Sharp, 2015. Today was a great family day at The Huntington Library, Art Collections and Botanical Gardens. All afternoon groups of children were attracted to the stencils, pencils and paper we had set out to try their hand at preparing botanical themed rubbings. Children had fun creating leaf and flower rubbings from stencil templates. They explored the different graphite pencil hardnesses and the effect that could be achieved with light and hard pressure on the pencils. Some ventured into color pencils choosing a favorite color to create shapes or writing their name to claim ownership of their creations. One adventurous artist started with graphite to define outlines then filled in with color. While most of the budding artists were very young, there were also older “children” who wanted to create a work of art. I had a fun afternoon giving basic instructions on how to do a rubbing, although most of my time seemed to be spent handing out fresh pieces of paper and sharpening pencils. 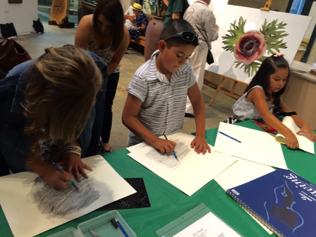 Exploring stencil leaf rubbings in graphite and colored pencil at The Huntington. Photo © Janice Sharp, 2015. A number of parents had to use all their persuasive powers to convince their children that The Huntington offered activities other than rubbings and they should explore them before the close of day. Invitation to BAGSC adjunct exhibition. 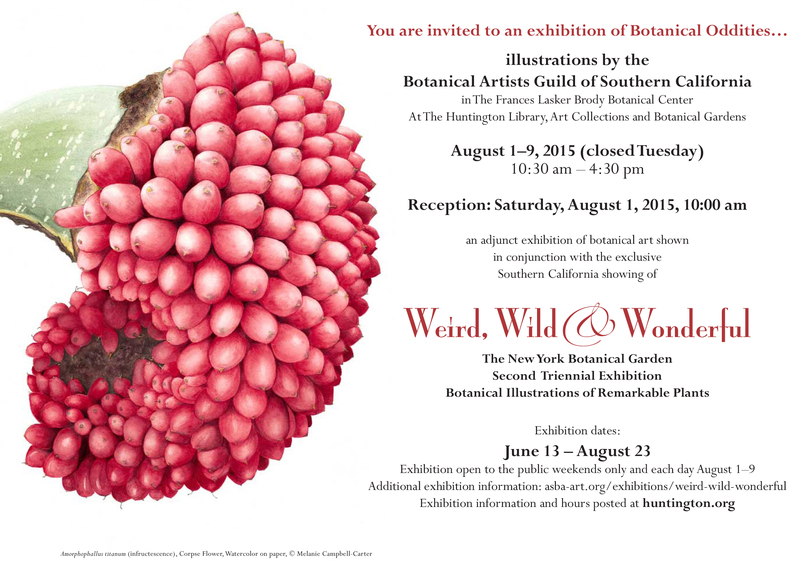 In conjunction with “Weird, Wild, and Wonderful” The New York Botanical Garden Second Triennial Exhibition, the Botanical Artists Guild of Southern California (BAGSC) will present a supplemental exhibition from August 1–9, in the Brody Botanical Center’s Banta Hall at The Huntington, featuring free public demonstrations, lectures about botanical art, and specimens of botanical curiosities. The BAGSC adjunct exhibition features 72 artworks by 37 members. before The Huntington opens to the public. The “Weird, Wild & Wonderful” New York Triennial exhibition also will be open the entire time the BAGSC exhibition is up, August 1 – 9, except on Tuesday, when The Huntington is closed. Bonnie Born Ash, Cristina Baltayian, Nancy Beckham, Melanie Campbell-Carter, Jan Clouse, Diane Daly, Estelle DeRidder, Nancy Grubb, Asuka Hishiki, Cynthia Jackson, Susan Jackson, Clara Josephs, Joan Keesey, Suzanne Kuuskmae, Teri Kuwahara, Patricia Mark, Lee McCaffree, Arillyn Moran-Lawrence, Kathy Morgan, Terri Munroe, Alyse Ochniak, Marilyn Parrino, Dolores Pope, Kathlyn Powell, Lesley Randall, Veronica Raymond, Robyn Reilman, Norma Sarkin, Mitsuko Schultz, Gilly Shaeffer, Janice Sharp, Deborah Shaw, Beth Stone, Gayle Uyehara, Lori Vreeke, Leslie Walker, Jude Wiesenfeld.